The Electrolux NHT8G (505070) pass through commercial dishwasher is a high-capacity dishwasher capable of washing up to 80 racks per hour. 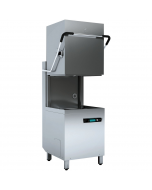 Requiring only 2 litres of water per cycle and featuring temperature interlock software for guaranteed 84c rinse, intelligent digital controls and variable wash-cycle it is the perfect pass through dishwasher for establishments that want ease-of-use and the highest levels of health and safety. 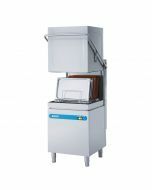 The built in atmospheric boiler is sized to raise incoming water temperature to a minimum of 84c, delivering a fully sanitising rinse on every wash cycle and guarantee a constant wash temperature regardless of incoming water pressure and temperature. 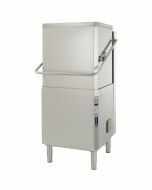 Combined with a WRAS approved type A break tank, the NHT8G (505070) meets waterboard approval for high-risk areas such as care homes, hospitals and day nurseries. Soft-start feature to protect delicate glassware from breakage. Programming and self-diagnosis system for serviceability and maintenance. Adjustable boiler temperature from control panel. Pre-arranged for on-site HACCP implementation and energy management devices. Integral drain, detergent and rinse aid pumps for automatic operation. Start/stop on hood close and open. 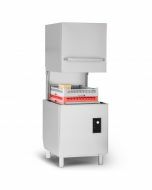 Manufactured from AISI 304 stainless steel including hood, wash tank, tank filter, stainless steel wash and rinse arms the Electrolux NNT8G pass through commercial dishwasher is hard-wearing and durable. The smooth pressed tank with rounded corners and specially designed stainless-steel wash and rinse arms above and below the dishwasher rack are easily removable to facilitate cleaning. Supplied on height adjustable legs with dishwasher basket, waste and water hoses for standard UK fitting as standard. Multiphase electrics shipped as 400v 3 phase power as standard but can easily be converted to 230v 3 phase or 230v 1 phase (30 amp hard wired) on site. An optional water softener is required in hard-water areas to validate your warranty.